Another part of the Daisenryaku series, of which several titles already have translations available. Two titles were even released in America. 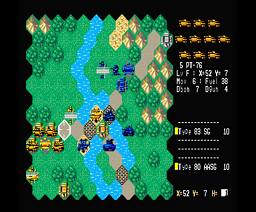 The basic game play remains the same, it’s a military strategy game somewhat comparable to Advance wars, but much more serious of course. 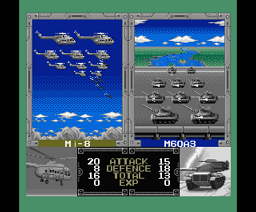 This title uses modern weaponry and fictitious battles as opposed to the WWII scenario of some other titles. The patch itself is supposed to be buggy, but it’s possible that the original unpatched version causes some problems for some emulators, too. This is especially true for graphical errors. This didn’t happen to me with BlueMSX during my play session, but the game becomes unplayable in ParaMSX, for example. Regarding the translation itself, all the menus and units seem to be translated, but I can’t tell if all the text during the campaign was. 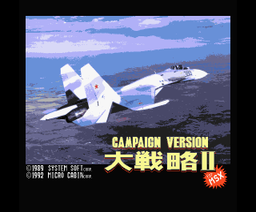 Note: This patch was made by ROMhacking.net member Starscream as a service to the community. The original patches were released in disk format only. We do not host ROMs or disk images here.